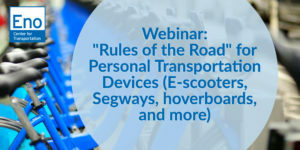 A new Mineta Transportation Institute (MTI) report explores the “rules of the road” around the use of emerging “personal transportation devices.” Also known as “micromobility,” the number and use of these devices has exploded in recent years, highlighted by the arrival of electric scooters in cities over the past couple of years. The report explores to the degree states, cities, and college campuses are or are not regulating these new devices. This webinar with the authors will review their findings and discuss recommendations from their recent report. Kevin is an Assistant Professor of Geography, Environment, and Planning at Sonoma State University and a Research Associate at the Mineta Transportation Center. His research centers on sustainable transportation alternatives, including recent work on skateboarding for transportation and cycling, and current work on emerging “micromobility” modes of travel. In particular, Kevin is interested in the characteristics and behavior of alternative modes and their users, as well as to the degree land use enables or precludes their use.